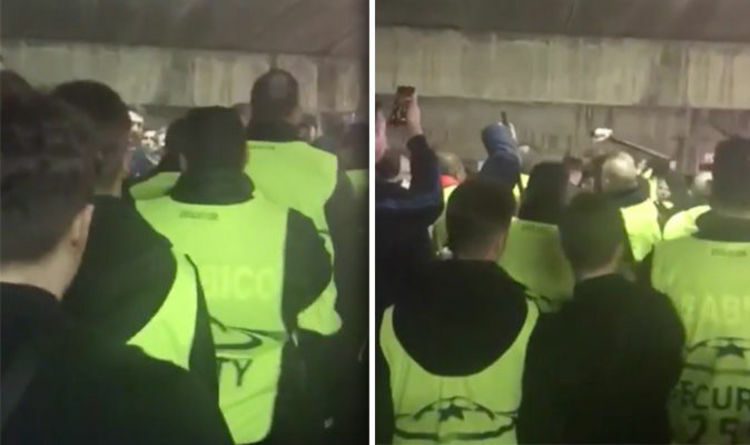 Shocking footages has emerged on Twitter appearing to show a group of stewards wearing hi-vis jackets march towards Chelsea supporters who were backed against a wall as they left the Nou Camp following the 3-0 defeat. Staggeringly, stewards can be seen taking out their batons and smacking fans leading to a scuffle between supporters and security staff. Chelsea supporter Rob, who claims to have filmed the incident, described what happened on social media. “This happened as we were leaving the stadium,” he wrote on Twitter. “Security pushed passed us aggressively to attack fans, a young supporter was left in tears. Another Chelsea fan said: “I was just down the walkway. In the wake of the incident, Chelsea have asked supporters for their version of events. “Chelsea Football Club is aware of incidents that took place at the stadium in Barcelona last night which affected a number of our supporters, both before and after the match,” the club said in a statement on their website. “We are seeking details of supporters’ experiences on arrival at the entrance gates at Camp Nou stadium, the passage through the entry system to the seats and then after the game, any information on incidents when exiting the stadium. Chelsea were dumped out of the Champions League thanks to a brace from Lionel Messi and a stunning strike from youngster Ousmane Dembele. The reigning Premier League champions followed Manchester United and Tottenham whose Champions League campaign also ended prematurely this week.